academic-bible.com shares your concern about how information pertaining to you may be used and possibly shared with others. We appreciate your trust that we will handle your data carefully and sensibly. Automatic information: We receive and store certain types of information whenever you communicate with us. For example, like many web sites, we use "cookies" for the log-in process and we obtain certain types of information whenever your web browser accesses academic-bible.com. 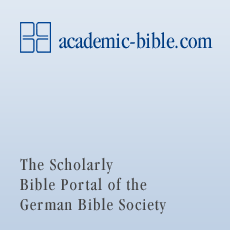 Does academic-bible.com share the information it receives? Protection of academic-bible.com and others: We will release account and other personal data, if and when we believe such disclosure is necessary to comply with legal requirements or to protect the rights, property or security of academic-bible.com, its users, or any third parties. Obviously, this does not include selling, renting, sharing, or otherwise disclosing personally identifiable information from customers for commercial purposes in violation of the commitments set forth in this Privacy Notice. What information can I access? academic-bible.com gives you access to all information of your account and your communications with GBS for the limited purpose of viewing and, in certain cases, updating such information.